Looking for a baby mattress pad? If you are tired of changing your baby or child's bedding in the middle of the night, you'll want to check out our review of two made-in-Canada crib mattress protectors that have become must-haves in our home. Have you had enough of wrestling with wet sheets and fitted mattress protectors in the middle of the night? Whether you're dealing with spit up or drool from a teething baby, the occasional leaky diaper, or a chronic bed wetter, the baby mattress pads from Lil Helper can bring you relief...When accidents occur, it is possible for you to get back to bed sooner with less disruption to both yours and your little one's sleep! Both of the baby mattress pads from Lil Helper can be laid on top of your baby's bedding. I find laying it on top makes for faster, easier clean-up (usually no sheet changes are required!) but you can tuck them underneath the fitted sheet if you prefer. (34x36") - is wide enough to fit on a twin size bed, and slightly wider than a crib - it can be tucked down the sides to make it fit. I really love the heavier weight for my toddler, who wiggles around in bed a lot... this pad just doesn't shift! Topped with a quilted organic bamboo/ organic cotton (70/30 blend) fabric, with a specialty fabric in the middle that absorbs all sorts of liquid and adds soft padding. The surface wicks moisture away, meaning it feels dry even after it's wet. (26x36") - is almost perfectly sized for a playpen - it comes within an inch or so of all 4 sides. Crib mattresses (and toddler mattresses) are slightly longer than those in playyards, so when used in a crib, the fleece baby mattress protector is not the full length of the mattress. I have found that it is plenty long enough for a baby laying on top - they don't need protection at their feet anyway! This mattress protector is topped with a feel-dry 100% polyester fleece that is soft and cuddly. It's important that it feels dry, because otherwise it would become cold soon after becoming wet. 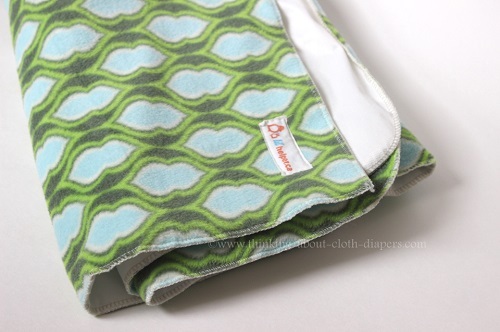 Has a layer of cotton jersey in the middle to absorb any wetness (drool, spit-up, pee). Please note: Before we get too far into this "review", I want to point out that this isn't a normal blogger product review. Lil Helper DID NOT send me these products free of charge to facilitate a review... after having to change the sheets on my son's bed in the middle of the night, every night for weeks on end, I purchased these products at full price in a desperate attempt to gain back precious minutes of sleep in the middle of the night. I haven't regretted that desperate purchase for even a minute! How does these mattress pads compare to other similar products? Lots of baby mattress pad protectors stink - but neither of these baby mattress pads contain stinky plastic or vinyl backing. If you're familiar with cloth diapers, you're probably thinking, oh, well it's PUL (polyester urethane laminate, a lightweight knit with a waterproof backing for those of you that aren't familiar with cloth diapers). 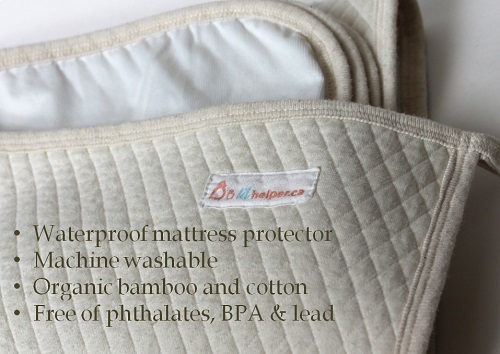 But the backing on these baby mattress pads is neither plastic nor PUL: it is actually a medical-grade waterproof material that is heavier duty, and of a somewhat rougher texture than PUL. More importantly, the backing material is also free of phthalate, BPAs, lead, and heavy-metals, and is made in Canada. Free of - I'm not an expert in all matters organic and green, but I'd rather not have my baby breathing in and laying on materials made of that stuff either. What do I love about this baby mattress pad? One of the best things about these crib mattress pads are that they lay on top of the bedding (although you could also tuck them under the fitted sheet if you prefer. I find it almost impossible to change bedding in the dark. The trouble is, by the time we turned on the lights and wrestled clean bedding onto our toddler's bed, we were all wide awake. 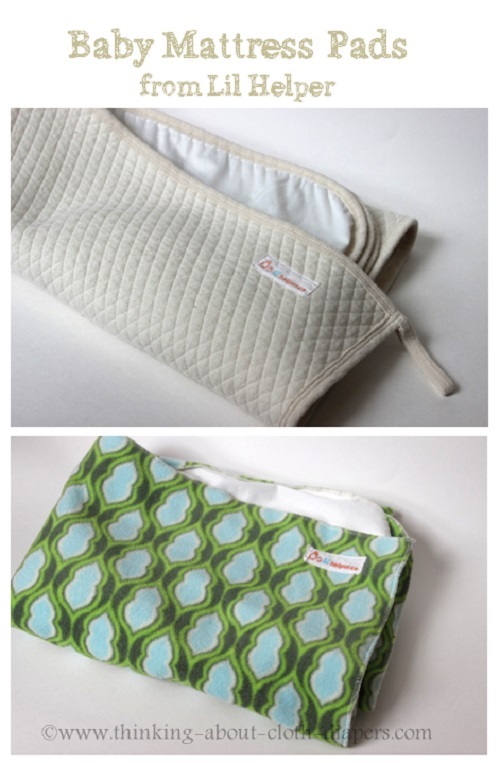 Good value for money - I can sew, but each product includes almost a full yard of fabric for each layer - which means that I can't even purchase the materials for the price that Lil Helper charges for their mattress pads. On a scale of one to four, with one being never and four being absolutely, I would rate these products with a four. They have become must-have baby essentials in our household, and I regularly recommend them to friends and family... they have made our life much easier and our nights much happier! I recommend purchasing 2 mattress pads - one for on the bed, and another as a back-up for when the first is in the wash. Overall, I prefer the bamboo mattress protector over the fleece, but I purchased the fleece one for our back-up to save a few dollars. The fleece one is now getting use with our newborn for co-sleeping and in the playpen. It's awesome that I can move it back and forth without taking the bed apart, and it's plenty large enough for baby! What Would I Change About This Mattress Pad? 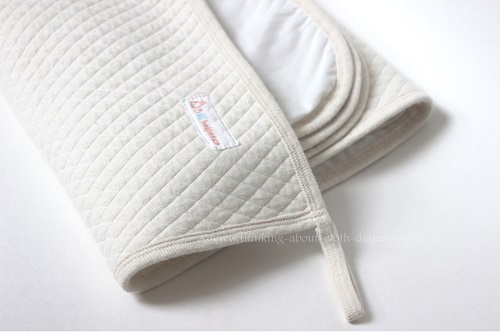 I wish that the fleece mattress pad had a binding on the edges, similar to the bamboo pad. I find that the corners on the fleece crib mattress protector sometimes flip up, and I think a binding would help it lay in place better. I love these baby mattress pads, but they don't replace the fitted mattress pad I have in my little one's crib. I would love to see Lil Helper introduce fitted mattress pad covers for cribs, play pens, and bassinet mattresses as well, since safe and organic products baby sleeping products are so hard to find! Both of these mattress pad protectors are available directly from LilHelper.ca. LilHelper offers free shipping to the US and Canada on orders over $79. Disclosure: I did not receive any form of compensation or free product from LilHelper.ca in exchange for this review, but they have supported events on Thinking About Cloth Diapers, including our Choose Your Charity Event. The opinions expressed in this post are entirely my own, and your experience with the product may differ from mine. This is an unsolicited review, and I only recommend products or services I use personally and believe will be good for my readers. This article contains affiliate links. I am disclosing this in accordance with the Federal Trade Commission’s 16 CFR, Part 255: “Guides Concerning the Use of Endorsements and Testimonials in Advertising.” For more information, see our Disclaimer and Copyright.